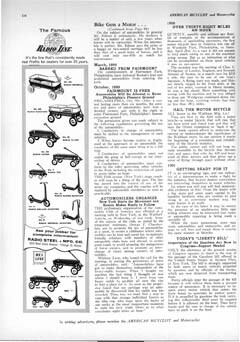 The December ’55 issue of ABM magazine was a 75th anniversary issue that contains a lot of reprints of old ads from the 1880’s up to current (1955). 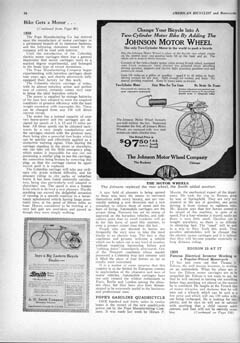 It also featured this great article about the history of motor attachments for bicycles. 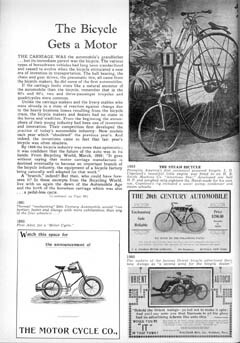 There is a photo of a steam powered hi-wheel bicycle, plus reprints of old ads for the Smith Motor Wheel as well as the Johnson Motor Wheel. Steam engine on a hi-wheel bicycle. Smith Motor Wheel and Johnson Motor Wheel.